NASA's Terra satellite passed over the Arafura Sea and captured an image of newly developed Tropical Cyclone 16P. The Arafura Sea is part of the western Pacific Ocean, located between Australia's north coast and the south coast of New Guinea. On March 22, the Australian Bureau of Meteorology or ABM, posted a warning and watch for 16P. The Warning Zone stretches from Elcho Island to Cape Shield, including Nhulunbuy. The Watch Zone runs from the Northern Territory/Queensland border to Thursday Island, including Weipa. On March 23, the Moderate Resolution Imaging Spectroradiometer or MODIS instrument aboard NASA's Aqua satellite captured a visible light image of newly formed Tropical Cyclone 16P north of Nhulunbuy. Animated enhanced infrared satellite imagery showed a consolidating system with a developing band of thunderstorms wrapping in from the west which means the storm is getting better organized. At 11 a.m. EDT (1500 UTC) on March 22, Tropical Cyclone 16P had maximum sustained winds near 40 mph (35 knots/62 kph). 16P was located near 10.2 degrees south latitude and 136.6 east longitude, about 349 nautical miles east-northeast of Darwin, Australia. 16P was moving to the east at 4.6 mph (4 knots/7.4 kph). 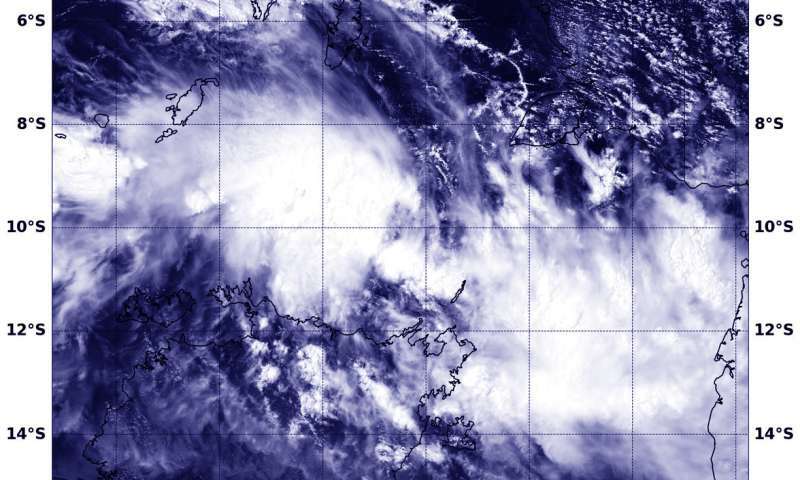 Tropical Cyclone 16P is expected to strengthen as it moves into the Gulf of Carpentaria. Models turning it back to the west after coming ashore in the Southern Gulf of Carpentaria. Residents along the Gulf should keep updated on forecasts, watches and warnings issued from the Australian Bureau of Meteorology. More information: For updated forecasts from ABM, visit: http://www.bom.gov.au.